Number 5 Type Collection: Vintage Giveaway Friday! Soon after this year's National Sports Collectors Convention in Chicago, I won an eBay lot of R346 Blue Tints. 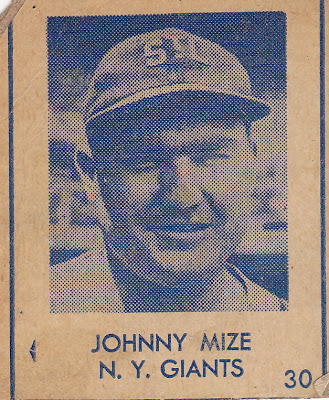 This obscure 1948 set's one of the last strip card issues sold by coin-op machines at candy stores or along boardwalks and players on its checklist run the gamut from superstar (Ted Williams) to posthumous (Lou Gehrig) to "wearing an unexpected hat" (Johnny Mize, sporting STL as a NY Giant). Card companies sometimes confuse teams or player photos; Mize hadn't played for St. Louis since the early 1940s, so this card uses an image that's both several years old and sports a curious team logo. I've never owned or even saw one other than online, but reverse negative cards have always been intriguing. I have the Billy Ripken error card and was happy to finally have it after years of waiting. My favorite goof is the 1973 Topps "Joe Rudi." I put his name in quotes because there are three A's players celebrating a home run, a dejected Angels catcher and an ump...but no Joe Rudi. I like the 1963 Topps Don Landrum because it really gives us an extra vintage Ron Santo card. Thanks for the contest! I'll go with the 1998 Topps Al Leiter (Steve George) RC. Gotta be Billy Martin giving collectors the finger on his 1972 Topps card. Billy Ripken's probably my favorite, but the 1990 Juan Gonzalez reversed rookie card is the favorite one I own. Did I just give the reverse of Ryan G's answer? I'll go with the 1965 Topps Bob Uecker shown as a switch hitter. I am a huge fan of the Billy Ripken. That card came out when I was a kid and gave me some good laughs. I love the Billy Ripken F Face card, and am thrilled to own a copy if it. I also find the story behind the 2006 Topps Alex Gordon mishap very fascinating. And thought I had snagged one in a coup for a hot minute. Gary Pettis letting his 15-year-old brother pose for him on his 1985 Topps card. Fantastic card. Thanks for the contest. I'll go with the 1988 Topps Mark Leiter mix up. It amuses me to think that a friend of mine and I would search rackpacks for packs containing this card (as well as Sam Horn and Gary Thurman rookie cards).